One of the best known and most successful American printmakers of the early twentieth century, Helen Hyde (1868-1919) found her identity in Japan where she lived for most of the fifteen years between 1899 and 1914, and which she considered her "home." Her support community remained a group of European and Euro-American women, in Japan, and in the United States. Female kin, friends, and fellow artists, particularly in San Francisco, Chicago, and Tokyo, nurtured her art, provided an audience for her artistic production, and gave her companionship. Japanese women and children were subjects of her most popular prints. Hyde was born in Lima, New York but grew up in the Bay Area where she began to study art at the age of 12. After her father died, a wealthy aunt supported and encouraged her artistic education. She graduated from Wellesley School for Girls, entered the new California School of Design in 1886, and studied in Berlin and Paris. While in Paris, she studied under Félix Régamey, a painter and teacher who had an extensive collection of Japanese art and who encouraged her to turn to Asian themes for her art. 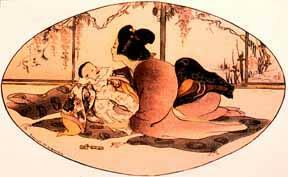 She probably also saw some of Mary Cassatt's early paintings influenced by Japanese perspective, pattern, and content. Back in San Francisco in 1894, she sketched women and children in Chinatown, and joined the Sketch Club, an association for professional women artists. Through the Sketch Club, Hyde met Josephine Hyde, who encouraged her to try etching. Together the young women experimented with color etchings and in 1899, after the death of Helen's mother, they sailed for Japan to study brush painting and etching. Josephine soon returned to the United States and abandoned her art career. Helen stayed on, became interested in color woodblock printing, and learned how to produce prints in a workshop system, with Japanese artisans who prepared the blocks and printed them. Hyde learned how to do each step of the process herself, then hired artisans who came to her studio where she supervised the work. In Tokyo she found European teachers as well, such as Austrian printmaker Emil Orlik who provided Hyde with her first tools and showed her how to cut blocks. In the United States, women had often provided these trained assistants to print designers as mass production of prints flourished during the print revival of the late nineteenth century. In response to the mass production of prints, members of the Arts and Crafts Movement advocated artists be their own artisans, performing the entire process of printmaking so they could vary each print slightly and thus make each print unique. Despite the Arts and Crafts emphasis on artist printing, artists influenced by Japanese artisan tradition, especially Pacific Coast printmakers, maintained the workshop system. Although supported by wealthy female kin when young, Hyde prided herself on the financial independence her art work enabled her to achieve as an adult. She marketed her work through dealers in San Francisco and through the well-known New York gallery owner William Macbeth. She produced sixty-seven woodcuts, never in runs of more than 200 copies, and sold them for $2.00 to $15.00 each. By 1914, she had signed an estimated 16,000 prints. The income allowed her to live a comfortable middle-class existence, but only with constant work. She traveled with American women in Asia, including collector Gertrude Bass Warner. Hyde never married, but clearly women provided companionship and support to enable her to lead the life of a satisfied professional artist. Critics of the time liked Hyde's woodblock prints best. One noted that Hyde's simple, fine handling of colors reminded her of earlier Japanese masters. Others liked her unusual sense of color, especially the use of "white light," deep rich green, and rose. They liked the flat, decorative effect she achieved by not having shadows. Critics praised her colors and the fact that the prints were Japanese in tone, quality, and suggestion. The following four color woodcuts exemplify these qualities of content and technique. Baby Talk (fig. 1) shows a mother and child totally engrossed with one another. The tones are very subtle shades of grey, brown, and yellow. Behind the two figures, a painted screen reproduces the natural world with tendrils from vines and iris. The woman's obi, the mats, and the child's wraps all provide contrasting but complementary patterns. The faces of mother and child are barely suggested. Winter (fig. 3) is an almost monochromatic view of women with children on their backs. The women are simply dressed, with no pattern, evidence that they are from a less wealthy class. The bare blowing branches and the covered heads establish the season. A Day in June (fig. 4) shows another mother and a slightly older child, this time in the open countryside. The child is fascinated with the flowers and the mother is intent on the child's delight. The colors have a broader range. Pale rose is mixed with greens tints and grays. Again, the faces are barely indicated with a few lines. In The Return (fig. 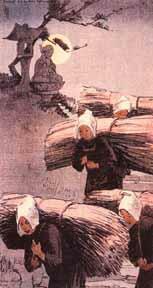 5), a line of four women descend a series of steps by moonlight carrying large bundles of wood. In the background a Buddha, shrine, and tree are illuminated against the moon. The white caps of the women stand out against a slate blue background with dark gray tones. While the background uses Asian identifiers, the women here are clearly working women, without kimono, and without children. The world that Hyde created in her color woodblock prints was one inhabited by women and children, occupying both domestic and outdoor space. It was a world without men. Her infants are under the control of women. They are washed, patted, carried about. It was a closed world of relationships between women and children, where women provided for physical and emotional needs. In other prints, women are shown at work, without children. With both types of woodcuts, the space is women's space. The very absence of men grants these women greater visual space. The viewer must concentrate on the women's world, whether domestic or public. While the Japanese women are retiring, even shy, they are not there for the male gaze. They occupy their own world and they assume control of this gendered space as a right. Hyde once quoted with approval the words of a woman doctor with whom she spent the summer of 1913: "[though] we may like men we don't need them and...there is nothing we can't do for ourselves except bring children into the world." Then she went on jokingly, that women should "pretend they are helpless even if they are not, to give men something to do, make them feel worth something." Hyde never pretended to that helplessness. Her letters to gallery owner Macbeth, while sometimes chatty, always give the impression that she could competently handle her affairs. The letters exude the sense of a confident businesswoman. Hyde loved the beauty of pre-industrial Japan, the natural landscape, the clothing, the houses, and the aesthetic traditions of Japan. She disliked the adoption by western male artists of the Japanese "beautiful woman" tradition, showing the Japanese Geisha. To her that seemed more of a cliché than the comfortable, beautiful world with rain and blossoms that she created for her women and children. Hyde remained committed to portraying the conventionally beautiful at a time when modernists and even other figurative artists were beginning to look at ordinary, sometimes bleak aspects of society. Once, when a fellow etcher in Tokyo urged her to work, she replied that she wanted to wait for spring "when everything is so lovely." He replied: "Never mind if it is ugly." But Hyde did mind. 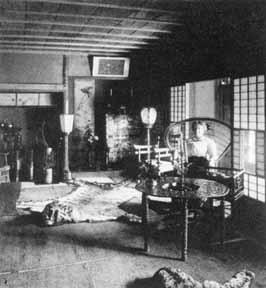 She had already begun to find some aspects of the modern Japan other than the winter season undesirable, particularly after their defeat of Russia in 1905 when the Japanese government urged industrialization and westernization of the country. Hyde resisted the new reality that industrialization was bringing to Japan, as it had to Europe and the United States. There was nothing to sketch, she wrote home in 1914: "even all the people are ugly." As Japan shed its pre-modern charm and the children began to wear western clothing rather than kimono, Hyde lost interest in her adopted country. She was increasingly ill with cancer by 1914, discouraged because she tired so easily, and unwilling to abandon the picturesque subjects that had first attracted her to sketching in San Francisco's Chinatown in the 1880s. Hyde returned home to the United States and died five years later. After Hyde's death, family and friends looked after her reputation, documenting her work, seeing that copies of prints were deposited in museums, and that her letters and printmaking tools were preserved in the California Historical Society. Such loving care of her work helped preserve it from destruction during the next decades when modernist critics saw her work as sentimental and lacking in boldness. Had Hyde been able to expand the range of women's experience, her work might have proved more enduring during these years. Still, the eclipse of her work in the 1920s was part of a general decline in interest in printmaking and in pre-modernist aesthetic values. Today Hyde's work is undergoing more careful critical evaluation as part of the renewed interest in the history of American printmaking, turn-of-the-century female art worlds, and the transfer of Asian artistic traditions to the Americas.